It's feast and famine when it comes to rainfall this summer. Depending on where you live, you might be watering your garden a lot or not at all. It was a wild evening yesterday over western and southern New England with flash flooding, hail, damaging winds and lots of lightning. The air felt like the tropics and indeed just like in Florida when the cumulus towers build during the day they often eventually yield some big gully washers. But those storms missed the Maine coastline again and this has been the summer pattern. Storms can’t seem to cross the Maine Turnpike if they make it there at all. 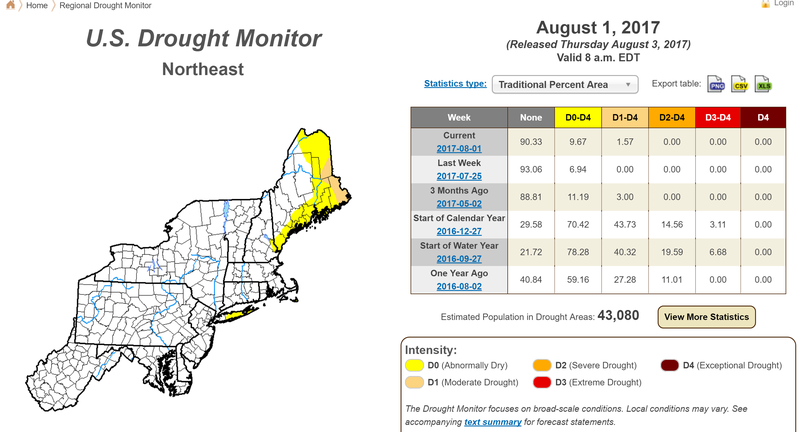 A drought is now official in eastern Maine and I’m surprised that more of the area from Brunswick to Penobscot Bay isn’t included. Yesterday’s inland storms are part of the typical summer pattern we are in with moderate to high humidity, warm temperatures and a chance of afternoon showers and storms. This time of year is often known as the Dog Days of August because we all feel rather lethargic in this tropical air. 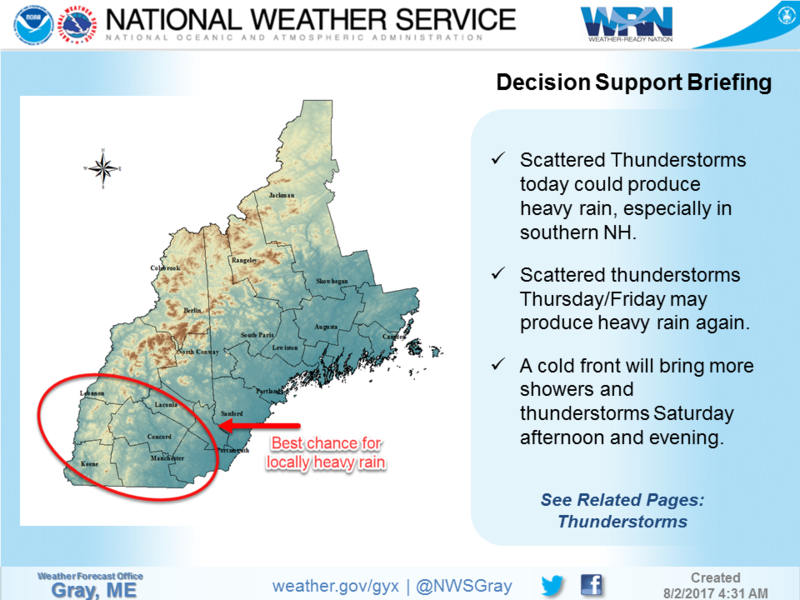 Areas over New Hampshire have the highest risk of downpours this afternoon. Along the coast I can’t rule out thunderstorms, but they are less likely and certainly won’t produce much rainfall except in isolated areas. This summer is very different from 2016 when we had little to no thunderstorm activity because of a persistent ridge of high pressure. The air in high pressure sinks and therefore storms can’t really build. That ridge also kept it much warmer than average. Last August was actually one of the warmest ever recorded in much of New England and was very dry as well. This year some areas had more rain in July than many saw all summer last year. The heat is out west this summer as the ridge has been persistent in that part of the country. The fact the coastline has been so dry is more of a localized phenomenon inside of a larger pattern. Overall, New England is out of the drought, but it seems to want to build back again here in Maine. While today is starting out nice, the chance of storms is still in the forecast today, Friday and Saturday because of high humidity and strong early August sunshine. Predicting if a particular town will get hit by a storm is impossible, but we do know the risk remains. Showers are in the forecast through Saturday. Tropical Tidbits. A cold front will pass through the area Saturday. This front will put an end to the humidity and the heat. As the front passes there is the risk for more showers and storms. Presently it looks like the bulk of atmospheric energy for these storms will be across northern New England. Having a cold front move into this type of humidity always brings the risk of downpours and thunder. Even so, I wouldn’t cancel any plans for Saturday; like yesterday, when coastal areas remained void of any storms, the same thing could happen around Greater Portland at the start of the weekend.